Though finding our primal male is an exciting prospect, the real revolution Wells describes is racial. While his descriptions of the advances made by such luminary scientists as Richard Lewontin and Luigi Luca Cavalli-Sforza can be dry, Wells comes through with sparkling metaphors when it counts, as when he compares genetic drift to a bouillabaisse recipe handed down through a village's generations. It was across the Bering Strait that modern man came to the new World — and it took him only a thousand years to reach the southern tip of South America. They still use these modern utensils to carve bone into arrow heads and so forth, and I am quite sure this guy knows how to distinguish between the modern utensils and devices they have acquired and older more primitive technologies. I read it in a very interesting book about Atlantis by a German scientist named Otto Muck. A person may think they are purely European or East Asian stock, but they in reality have many ancestors not that long ago from quite far away. All in all, I really enjoyed this book, which is more a testament to my interest in the subject than the execution of the author. And why, if modern humans share a single prehistoric ancestor, do we come in so many sizes, shapes, and races? Working my way through the first few pages, I got a bit alarmed. 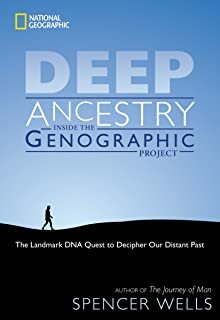 Wells is the director of the Genographic Project, and his mission is directly reflected by his book. Corroborating evidence for the biology comes from the study of our languages, their similarities and differences, and especially their evolution. This makes sense to me and great doc. Showing how the secrets about our ancestors are hidden in our genetic code, Spencer Wells reveals how developments in the cutting-edge science of population genetics have made it possible to create a family tree for the whole of humanity. Over the edge Good point, why didn't I think of that? Somethings are simply evident to the naked eye, and are just the way they are- whether science admits it or not. Kanamori, a teacher of a 4th grade class, teaches his. As humans migrated out of Africa, they all carried a genetic feature on the Y chromosome known as M168. Had a to vomit a bit frankly, whatever the intensity of my cusriosity and interest and my respect for this guy's scientific talent and tenacity. We now know not only where our ancestors lived but who they fought, loved, and influenced. The linear way in which it is written also helps achieve reader familiarity. I am left with a general feeling about the topic but couldn't carry on a conversation about it. He briefly discusses the theory that all languages may have come from one original language and how linguistic anthropology can use this to track migration. In achieving that accessibility, he has not made the common error of confusing simple explanations with simplistic ones. The small physical size of the paperback is convenient. You will never get angry enough to change an opinion. I thought the reason he didn't talk about other indigenous peoples is because the next place our bones showed up in the time line was Australia. It does seem awfully odd that they would leave not a single trace all the way from Africa to Australia. Lighter skin of course allowing for greater capture of the suns' rays. Shaka The information I have found on the San people say they have never left Africa, in other words yes they originated from East africa like everyone else and somehow ended up in South Africa as the San tribe. I really love learning about human genetics and origins, about mitochondrial eve, the mother of us all, living in africa, and trying to wrap my mind around how that could possibly be. The Dravidian languages are completely unrelated to the Indo-European languages. Could have covered a lot more detail in that period, or consolidated this to about 40 mins. I suppose if they had of adopted something more modern they would have skipped the newer bow and arrow and grabbed a white mans gun. Fascinating and accessible read for anyone interested in early human migrations and prehistory. 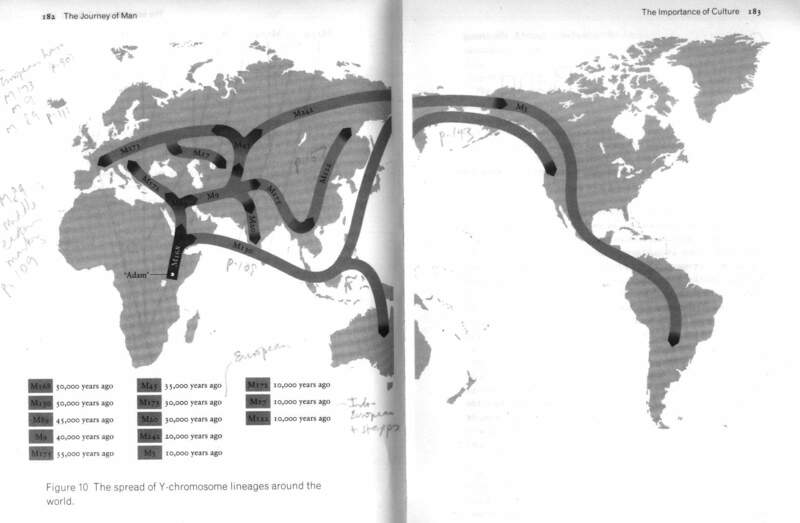 He shows that by following the coastal route out of Africa our human ancestors could move rapidly across the planet. Which is more than I can say for your arguementive attempt. And a great documentary about it. How did this real-life Adam wind up father of us all? And if all of us have a common male ancestor then why do we all look so different? Spencer Wells traces human evolution back to our very first ancestor in The Journey of Man. Just between us, I all but royally flunked every science class I ever took from Grade 3 onward, and this book was giving me that familiar brain-dead feeling I always got in science class. By explaining his terminology and methods throughout the book, instead of in a chunk, Wells makes following the branches of the human tree seem easy. The diversity found outside of Africa may well have been accentuated since populations migrating to new hunting grounds would rarely have had individuals moving backwards into previously settled regions. To be sure, the work is peppered with scientific data, which was sometimes off-putting for me. Overall, this is an excellent, clear, and succinct discussion of the topic, and I would definitely recommend it. I expected the book to follow the documentary closely but provide more scientific details. But I was surprised to find the book pair genetics and the expansion of humans across the planet with linguistics and the history of language -- a topic that I enjoy. 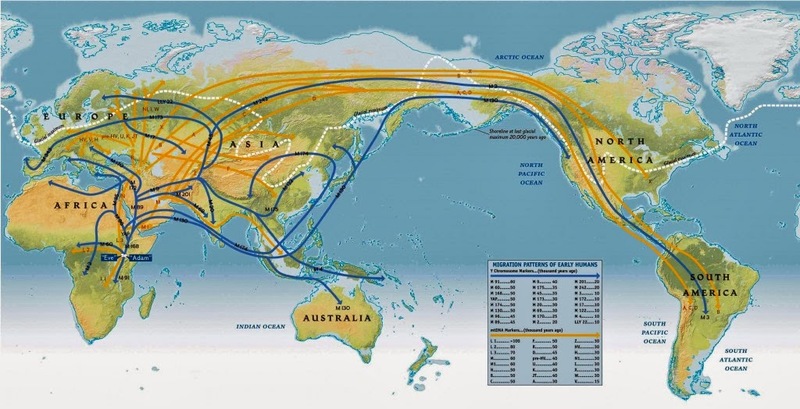 The writer tried to summarize the modern population genetics evidences of man journey from Africa to the whole world. We all come from Africa - that is well known - but all modern humans stem from the same African woman who lived 150,000 years ago. A great video that is sure to entice your class. More than him though, I love the click like language of the tribe featured. I liked this a little more than Deep Ancestry but this argument is still pending and new research is being unearthed with new technology.